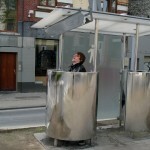 I added a mirror to 2 of the public/private male urinals in the city of Gent. 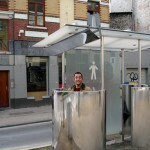 Passers-by will get to share in the joy of public urination as a unwitting man relieves himself. 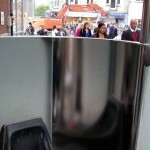 Many people assume that they have a right to certain degree of privacy in public places. As we move about there is a tendency to view our public surroundings as potential places where we can assert our sovereign nature. For instance a person might go behind a tree, hide in a shadow, go down an alley, or squat under a bridge to seek public solitude. In parks people lay claim to a patch of earth by unfolding a blanket and spreading it on the ground. Construction zones and yellow â€œcautionâ€ tape steer the public away from certain areas to create temporary private spaces. 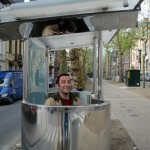 Cities even build places like phone booths and bathroom stalls for its citizens to enjoy private moments. As technology advances citizens ever increasingly walk around enraptured in the bubble of their cell phones. And, if a person is of a more pensive disposition, he or she might find their public/private moments walking, staring at the ground, while lost deep in thought. Public privacy can also exist on a subtler, subconscious level as we are taught from a young age to ignore certain public occurrences. The drunken man passed out on the ground or the beggar asking for change at the bus stop might appear to us no different than a tree or a lamppost as we make our way to work in the morning.When we stare past the woman being arrested by the police or ignore the man weeping on his stoop we effectively give the person who is having a public/private moment the privacy of our ambivalence. But, regardless of how the privacy manifests, it can only exist through an unspoken social contract that permits a person the right to assert and create his or her own overt or subconscious public privacy. And, despite the complicated game that manifests as a result of this silent agreement, most of us intuitively know that public/privacy is an illusion and a creation of man. There is no privacy. 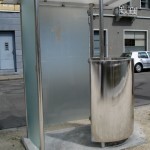 This piece was done as part of the Electrified 2 Exhibition which was a collaborative effort between The Vooruit Center for the Arts and S.M.A.K. 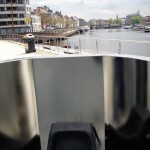 in Ghent, Belgium. Special thanks to Eva DeGroote for including me in this exhibit!! 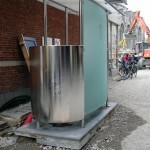 Also, thanks to the facilities staff of Vooruit for allowing me to use their fabrication studios…especially Koen Blondeel for helping me everyday!! And…thanks again to Gregg Young for filming and editing the video!